Has it ever happened that you come across a music video on YouTube and just feel like downloading the audio track instead of the entire music video? Or may be you want to rip an amazing background song from a DVD movie? The answer is definitely "Yes". You are in need of a free audio extractor for help, a software that can rip audio from video or DVD movies. Well, according to the different input files, audio rippers are specially designed for certain instances, stressing in common videos or DVD movies. Thus here we encountered in two totally different situations for the tasks. This is most common for us that searching for a music song on the web and occasionally find it in a video. This is why we need to convert video to audio. No matter where you find the video, YouTube, Facebook, Dailymotion, and what the video format is, MP4, AVI, FLV, MOV, MacX Video Converter Pro is capable of downloading any videos in the cases and ripping the audio tracks from video. It was built in a powerful video converting engine which enables you to freely convert video to MP3, WAV, AAC, meanwhile converting videos from format to format, like FLV to MP4, MKV to MOV etc in super fast speed with lossless high quality. 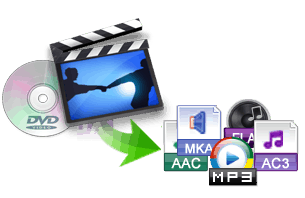 MacX Video Converter Pro is a 2-in-1 video downloader and converter, thus you can accomplish these two tasks together. Firstly, you need to free download the audio extractor and launch it on your computer. Click YouTube > Paste & Analyze video URL > Choose format > Click "Download Now"
1. Click "Add Files" to import the downloaded video with awesome song. 2. Choose the output format. Click "To Music" to decide what audio format you'd like to convert to, MP3, AAC, WMA, AC3, AIFF, CAF, OGG etc. 3. Specify the output folder destination by clicking "Browse" button. 4. Finally, click "RUN" button to start converting video to audio. Well, we found amazing music not only from online YouTube sites but also DVD movies sometimes. Things are similar to the solution 1 except a different audio extractor for DVDs. 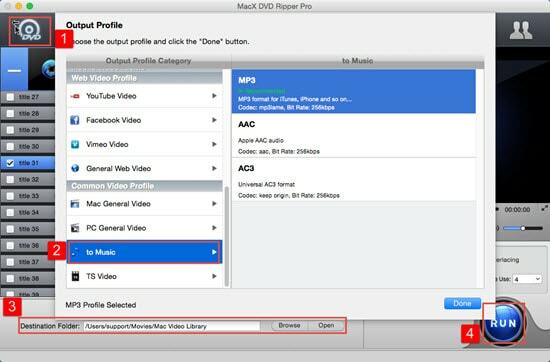 MacX DVD Ripper Pro is what you are looking for. It behaves professional at ripping DVDs to audio music like MP3, AAC, AC3 etc. It bypass all DVD encryption, the general CSS encrypted DVDs, Sony ARccOS protected DVDs and all region 1-6 commercial DVDs and even the latest Disney X-project protection. So no matter what the DVD is encrypted, you are freely to extract MP3 from DVDs so as to enjoy them on your iPhone iPad iPod Android or MP3 players. Step 1: Add files. Similarly free download the audio ripper aimed at DVDs and run it. Click "DVD Disc" or "DVD Folder" button to import the DVD files. Step 2: Choose Output Formats. Click "To Music" to select the audio output format as you desire, MP3, AAC, AC3 are all on your pre-selected list. Step 3: Choose Output Folder. Click "Browse" button in output setting area and select a destination folder to save your ripped audio from DVDs. Step 4: Start Ripping. Click "RUN" to start ripping DVD to audio as you like. With this best DVD ripper for Mac, you can also view the ripping progress and are able to cancel the ripping process at anytime. How to extract MP3 from YouTube? The best YouTube MP3 extractor to download/rip MP3, audio, music, songs from YouTube video/playlist in 320kbps, 128kbps quality for Android, iPhone iPad is shared. Are you in urgent need of a free YouTube to MP3 converter for Mac? This guide shows the best freeware and gives you tips to free convert YouTube video to MP3 on Mac for playback on MP3 player, iPod, Zune, Zen, etc offline without quality loss. We enlist top 7 free online audio converter that allows you to quickly extract audio file from videos and convert between different audio formats, like MP4 to MP3, AAC to MP3, FLAC to AAC, and more. 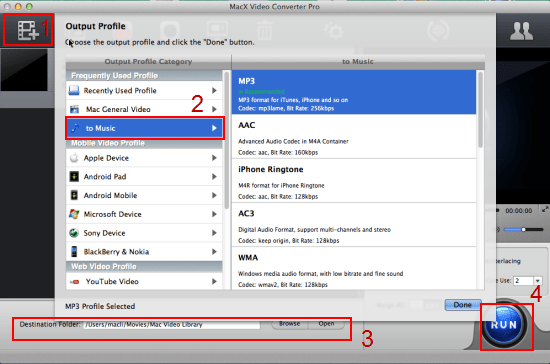 MacX Video Converter Pro is the best video to audio converter, which can easily extract MP3 audio from videos Mp4, MKV, WMV, MOV, AVI, etc, along with excellent YouTube video/audio download feature.